Botox® is an approved drug, based on the protein substance botulinum toxin type A. The protein does not accumulate in the body as it is naturally secreted in the urine, so you can repeat the treatment without problems. Botulinum toxin prevents the release of neurotransmitters between the nerves and muscles, causing the muscle to relax. The botulinum toxin therefore works on so-called dynamic or mimic wrinkles, i.e. wrinkles that are a result of muscle contractions in the skin. 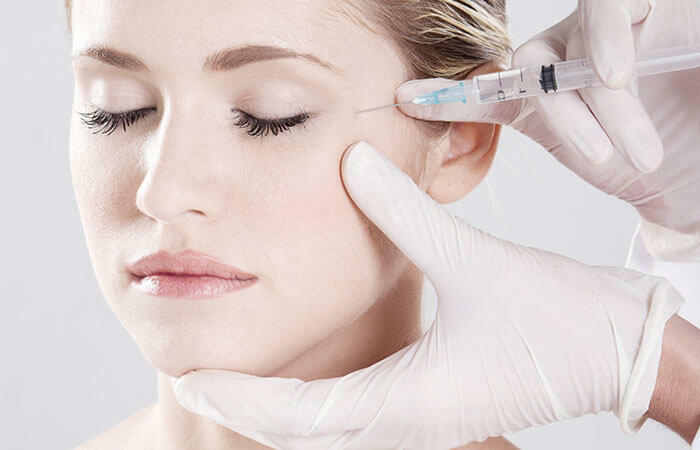 After the injection with botulinum toxin, the muscles that fold the skin, for example in the forehead or around the eyes, can no longer contract and the skin appears smoother. The sense of touch on the treated area remains unchanged. It is possible to combine the treatment with botulinum toxin with non-permanent fillers, laser or other skin rejuvenation treatments. How do i know how many areas must be treated? It is very individual how areas are divided in connection with a Botox treatment. We always advise you before a treatment and please contact the clinic if you have any questions. Botox is a wrinkle treatment that can reduce the appearance of dynamic wrinkles in the face. That is, the wrinkles caused by contractions of the facial muscles and that are an integral part of our expression, but which also become more pronounced with age and visible even when the face rests. Botox is usually the preferred choice when it comes to wrinkle treatments in the upper part of the face, where you can smooth out frown lines, worry lines or crow’s feet. It is also possible to create a discrete eyebrow lift with Botox and on the lower part of the face Botox can be used to smooth out wrinkles caused by smoking, chin wrinkles and pulling a sad mouth upwards. Botox distinctly accomplishes a smoother appearance. The effect of Botox occurs after 8-12 days and disappears after 3-4 months. The result looks natural and does not limit your gestures or your facial expressions. In fact, most people won’t be able to see that you’ve had Botox. They’ll just notice that you look refreshed, like after a long vacation – or they may think that you are in love! If the effect is too subtle or if you find the result asymmetrical, we can do a ‘touch-up’ treatment after 2 weeks. The ‘touch-up’ is free and included in the price. Call the clinic to order a ‘touch-up’. Before your first Botox treatment at Inviocare, you must have a free consultation with our specialist in dermatology. It is also a legal requirement that you have 48 hours of reflection before the treatment itself. We carry out the treatment by inserting small amounts of botulinum toxin in the delicate facial muscles in selected areas with a very fine needle. Meanwhile you sit comfortably reclined in a clinic chair, so that you are as relaxed as possible and the therapist has full access to your face. The treatment area is disinfected before the injection. Sometimes subtle marks will be visible on the skin after the treatment where the needle has gone in. These marks are harmless and a bit of ice on the area usually helps. Any redness or swelling disappears quite quickly, usually within 1 hour or max. within a few days. And from there, all you need to do is keep an eye on the little gift that Botox leaves each night, as the treatment works and the effect appears. It is a gradual process and you will notice a little more each day for up to two weeks.